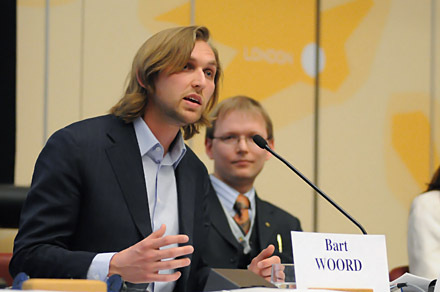 After spending several months working with youth activists and civil society in the South Caucasus, International Federation of Liberal Youth  (IFLRY) Secretary General Bart Woord  took time out from a hectic schedule to speak to Global Voices Online about the role new media can play in the region. With youth activists in both Armenia and Azerbaijan facing increasing intimidation from the authorities , Woord specifically comments on the case of Adnan Hajizade and Emin Milli , two video bloggers recently detained in Baku on what many consider to be politically motivated charges. The interview makes specific reference not only to the more recent detention of activists in Armenia and Azerbaijan, but also to the 10 May dispersal of youth protesting a flower festival  held a little over a week after the 30 April massacre of students in a Baku university . Himself a blogger , Woord was responsible for reporting on the situation of dozens of activists detained via Twitter and refers to the role new media can play in bringing youth activists in the region together. Background information can also be found in similar interviews held with Arzu Geybullayeva  and Micael Bogar .